The dollar coin has never circulated well in America. Even designs that are loved by collectors today, such as the Morgan dollar, struggled to find their way out of contemporaneous storage vaults as consumers simply didn’t want them. The Susan B. Anthony dollar was supposed to fix this problem because it was finally a small and convenient size. They didn’t succeed, and it looked like the dollar coin might be dead forever in the 1980s and ’90s. And then the Sacagawea dollar popped up in 2000. Why Did We Need Another Dollar? After the flop of the Susan B. Anthony dollar, it seems a bit peculiar that the Mint decided to create another small dollar coin. However, in the 1990s, demand for dollar coins was actually picking up. Vending machines, mass transit companies, and stamp machines continued upgrading to accept the small dollars, and they became popular for these purposes. They didn’t circulate in day-to-day commerce, but for those specific uses, they found their place. As the store of Susan B. Anthony dollars ran down, new legislation was proposed for a different design to revitalize the dollar coin. 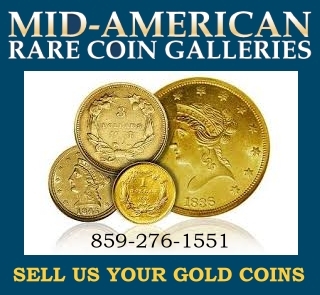 It was suggested in 1995 by Senator Rod Grams (R-MN) but faced strong opposition from the United States Mint. After the last dollar coin fiasco, the Mint wasn’t interested in repeating its mistakes. 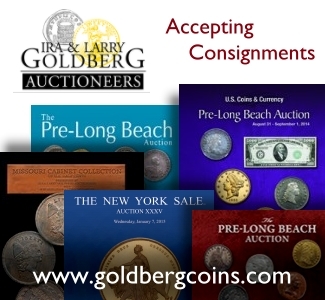 This proposition also called to remove the dollar bill from circulation to – hopefully – get the new coins to circulate. 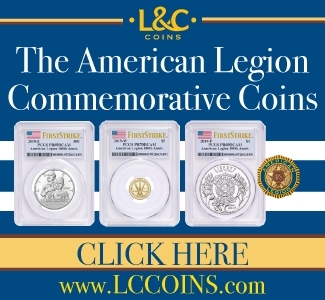 This legislation was included in the 50 States Commemorative Coin Program Act, which also created the 50 state quarters program and the first flight commemorative coins of 2003. The entire bill was signed into law on December 1, 1997, by President Clinton, officially reviving the dollar coin. It allowed for more Susan B. Anthony dollars to be struck if the supply ran out before the new coins were ready, which did happen in 1999. The Secretary of the Treasury requested a depiction of one or more non-living women and appointed a nine-member advisory committee to choose whom that should be. Many different ideas were suggested, including Eleanor Roosevelt, Sojourner Truth, and an abstraction of “Peace”. Representative Michael Castle advocated the Statue of Liberty, similar to the original concept for the Susan B. Anthony dollar, but Sacagawea was ultimately chosen. The Mint hosted a design competition among 23 different artists and sought significant public input. With the internet, it was significantly easier to seek feedback from the public than it was in the 1970s when the widely-hated design for the Susan B. Anthony dollar was chosen. The Mint held focus groups and received over 90,000 emails from citizens voicing their opinions on the design for the new coin. In the end, an obverse design by Glenna Goodacre was chosen and a reverse by Mint sculptor-engraver Thomas D. Rogers Sr.
Castle, however, wasn’t ready to let his Statue of Liberty idea go. He got the General Accounting Office (GAO) to conduct a poll to see whether the public found Sacagawea or the Statue of Liberty more appealing for the new coin. Of the responses, 65% preferred the Statue of Liberty, but the Mint ignored the results and continued with the Sacagawea design. Goodacre herself inadvertently created one of the rarities of the series. She was to receive $5,000 in return for her work, and she requested that it be paid entirely in new dollar coins. The Mint struck these on specially burnished planchets, resulting in 5,000 coins that are distinguishable from the rest of the series. The Susan B. Anthony dollar received a $600,000 marketing program, but the amount spent on marketing the Sacagawea dollar ran up to $41 million. There were widespread commercials, print ads, and radio spots announcing the new “golden dollar”, as well as multiple corporate partnerships. The commercials featured actor Michael Keaton with George Washington’s head from the $1 bill, talking about the advantages of the new dollar coin. He addresses, among other things, the apparent concern that people would expect to see Washington on the dollar coin. He is seen going through a variety of activities, such as teaching an exercise class, buying a cup of coffee, and going into space as an astronaut. They also partnered with General Mills to create a program involving Cheerios cereal. 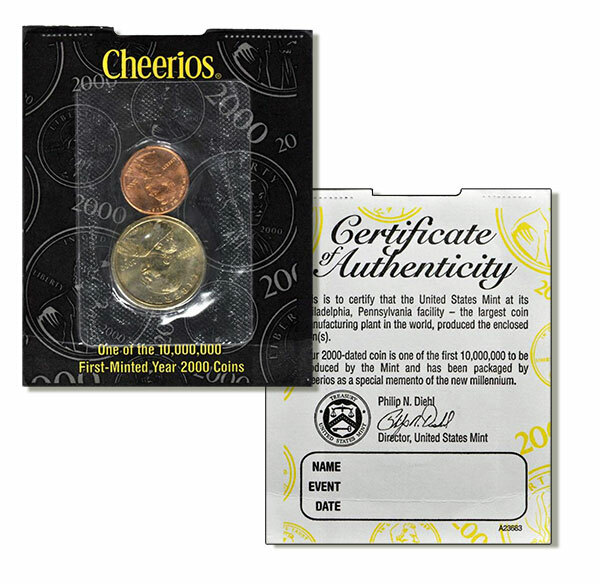 Ten million boxes of Cheerios contained a 2000 penny, one in every 2,000 contained a Sacagawea dollar, and one in every 4,400 contained a certificate that could be redeemed for 100 Sacagawea dollars. In 2005, numismatist Tom DeLorey noticed something odd with some of the dollars found inside a Cheerios box – there was extra detail in the eagle’s feathers not seen on regular issues. These are now known as the Cheerios variety. It’s thought that, since these coins had to be sent to General Mills early to be put in boxes, some were struck from a different reverse die that was changed before the general release. Regardless of the reason, few are known and are worth over $2,000 in mint state. The other large corporate partnership was with Walmart. Over 100 million Sacagawea dollars were sent to Walmart stores across the country and released there on January 30, 2000. They were given out as change up to $10. This was the first time a coin was ever released this way, and the result was mediocre at best. The goal was to get them into general circulation, something the Susan B. Anthony never managed to do. However, many customers that received them were more interested in keeping them as souvenirs than spending them. This strategy also caused confusion and controversy. The coins weren’t released in banks until March, a month after they appeared at Walmart. Customers didn’t understand why they couldn’t get the new coin at banks, and bankers were frustrated that they weren’t able to distribute them. In addition, small business owners balked at the Walmart release; they weren’t able to get the Sacagawea dollars to participate in the release, and they felt this gave Walmart an advantage and could hurt their business. The design was widely seen as an improvement on the Susan B. Anthony dollars. It was soft in comparison to the harshness of Anthony’s portrait, and the gold color was a welcome change to help distinguish it from the quarter, although it does tarnish quickly in circulation. The coins also had a smooth edge to make them easier to distinguish by feel. However, people complained that they were still too hard to quickly tell them apart from other coins due to their size. 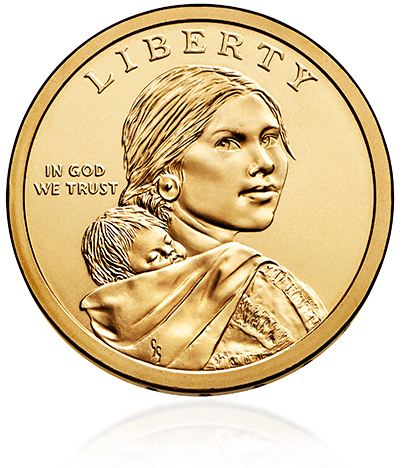 Sacagawea dollars have the same diameter as the Susan B. Anthony dollars, which enabled them to be used in vending machines without modification. This also drew criticism, as some felt they were more tailored to the vending industry than the consumer. There was a decent demand for the coin, but most of it seemed to be with the intent of keeping, not spending them. According to the Texas City Sun, “People want[ed] them for gifts for children and for collections.” While this helped stop them from sitting in vaults, it didn’t successfully get them into circulation. Finally, there was additional criticism of the marketing strategies used. They were advertised as the “golden dollar”, despite containing no gold whatsoever. They’re made from a combination of copper, zinc, manganese, and nickel. Some felt that calling them “golden” was dishonest and could mislead the public. Over 1.2 billion Sacagawea dollars were minted for circulation in 2000, followed by only 133 million in 2001. The mintages continued to decrease as the demand failed to pick up, ultimately settling around five million circulation strikes in 2002-2008. During these years, they were made for collectors only and weren’t released for circulation. Although they may not have done so well in America, Sacagawea dollars did, interestingly enough, find favor elsewhere. Starting in 2002, the Federal Reserve began to ship Sacagawea dollars to Ecuador, which also uses the US dollar. They became popular there because paper money doesn’t last long in a tropical environment, and the portrait of Sacagawea resembles an Ecuadorian Indian woman. Similarly, they’re used in El Salvador, where they are also preferred to the dollar bill. In 2009, a new Native American dollar program began, with the reverse of the Sacagawea dollar changing each year to depict significant contributions to the history and development of the United States made by Native Americans. 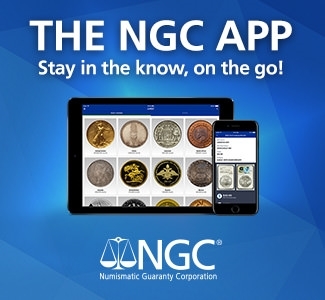 This new program also requires that the Native American dollar accounts for at least 20% of all dollar coins minted, meaning that sales of the Presidential dollar drove up mintage figures. In addition, the Mint tried once again to get them into commerce, so Native American dollars were released for circulation at the start of the program. This resulted in a three-year mintage spike from 2009 to 2011, though never breaking 100 million. In 2012, it was clear that the coin still wouldn’t circulate, and they were once again made only for collectors. Mintage numbers fell back to around five to six million circulation strikes per year, where they remain today. The main argument for replacing dollar bills with coins has always been profit. Paper money doesn’t last as long, and the lifespan of a coin would make it cheaper in the long run. However, even this argument is losing its ground. The Federal Reserve has changed its manufacturing process to make bills last longer, and it’s estimated that a new dollar bill will now last almost eight years in circulation, compared to 34 years for a coin. This is still a large difference, but it is more expensive to mint the coins in the first place. According to a recent study by the GAO, when estimated over a 30-year period, it would no longer be cheaper for dollar coins to be used in place of bills. In fact, it would cost millions to replace all our dollar bills with coins. It’s clear that Americans have no desire for a dollar coin. They were unpopular from the very beginning, and it doesn’t look like that will be changing anytime soon. With no economic advantage to switching, it might be time to retire the dollar coin altogether. For now, however, the law doesn’t dictate an end to the Native American series, and the new American Innovations series is set to last through 2032. The dollar coin is going nowhere anytime soon. Pruitt, C. “New dollar coin appears on mainland.” Texas City Sun 8 Feb. 2000: 5. Print. The unstated question here is why and how so many other countries have successfully replaced their two lowest-denomination notes with coins while the US can’t. The stock political response that “America is different”, aside from being overly simplistic, can’t be even a partial explanation. Could it be that the Mint’s multiple blunders with the SBA doomed the denomination in the same way the 50¢ piece was fumbled from being a common coin into a strange curiosity? Or maybe it’s the inexplicable refusal to also make a $2 bill or coin that would answer valid concerns about carrying “sacks of Sacs”? Something else?